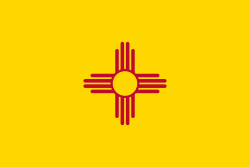 It’s no wonder why alien abductions happen in New Mexico. There is endless, desolate nothing between the smallest of towns where a handful of people live every billion miles or so from one another. If a giant flying saucer came down and sucked up or returned a couple people there would be few possible witnesses. Smart aliens. With names like Pie Town and Truth and Consequences, those tiny towns have their own intrigue and charm. Old worn vintage signs and rusting RV’s parked in over-grown grass and kitschy, gimmicky restaurants famous for burgers based off their town’s namesakes like Hatch, New Mexico make up the most of the middle of the state. And somewhere amongst it all is an unexpected world within a world, White Sands National Monument. Flat desert land suddenly transforms into tall mounds of pure, fine, white dunes made of rare gypsum sand. The stunning landscape stretches as far as the eye can see and lends itself to a playground for sledding and channeling your inner child. The huge open landscape of New Mexico is beautiful. It has a way of making you feel tiny, nearly nonexistent and unimportant. It’s humbling and oddly calming to to feel so small and alone. The vast, engulfing beauty overrides life’s little concerns and highlights what we often fail to look up and see. The world is full of beauty. Hasta la vista, New Mexico.